Choosing the best lighting for a home may not always be that crucial, but business owners know how vital it is to find the best UFO high bay LED lights possible. Of course, LED lights are far from the only option when it comes to UFO high bay lighting – there are many other industrial lighting technologies out there – but LED lights have quickly become the most popular choice. And rightly so, there are almost countless reasons to choose LED lighting over anything else for your industrial lighting needs – they start up faster, they last much longer, they consume less electricity, they are less susceptible to lumen depreciation, they are significantly easier to use with motion/occupancy sensors for dimming, and so on. Even if we ignore most of these benefits, however, and focus just on the energy-saving aspect of UFO high bay LED lights, the difference between them and non-LED lighting is staggering. 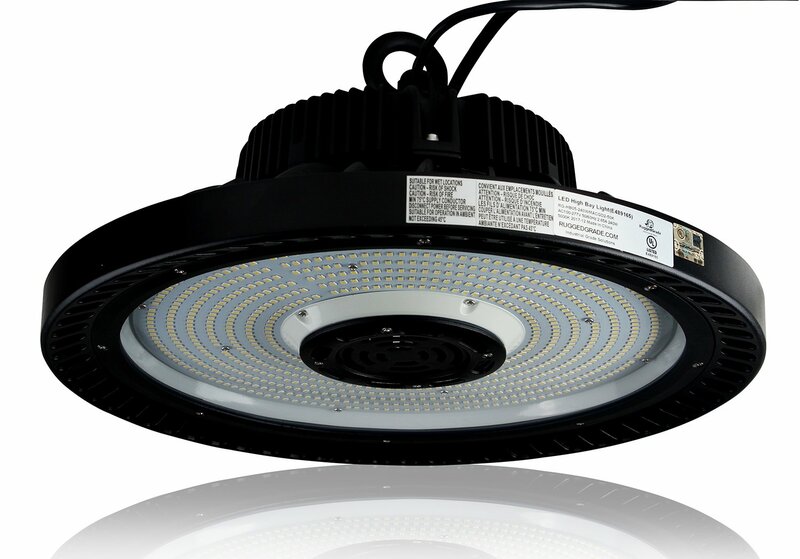 A good UFO high bay LED light can cut the energy consumption of a warehouse or a parking lot by 3 or 4 times. In some cases – even more. The larger your property is and the more lighting you need, the more significant this difference becomes. With no serious competitions, LED lights are clearly the way to go but how do you go about buying them? Surely, as with any other product group, there are different types and quality UFO high bay LED lights? Yes, yes there are. As with all other products, the UFO LED lights you will encounter on the market will range from Top quality amazing ones to sub-par ones that will mostly be a waste of time and money. So, how does one choose the best UFO high bay LED lighting for a warehouse, a parking lot, a commercial store or any other industrial property? Well, that’s what we’ll go through in this article. Below we’ll cover the Top 3 and Top 10 best UFO high bay LED lights on the market right now and after that, we’ll go over their main characteristics, how to find and purchase the best-LED lights, and how to use them to their full effect. With 100 watts of power and 14,500 lumens of brightness, as well as excellent design and premium materials, this is a great LED factory lighting lamp. 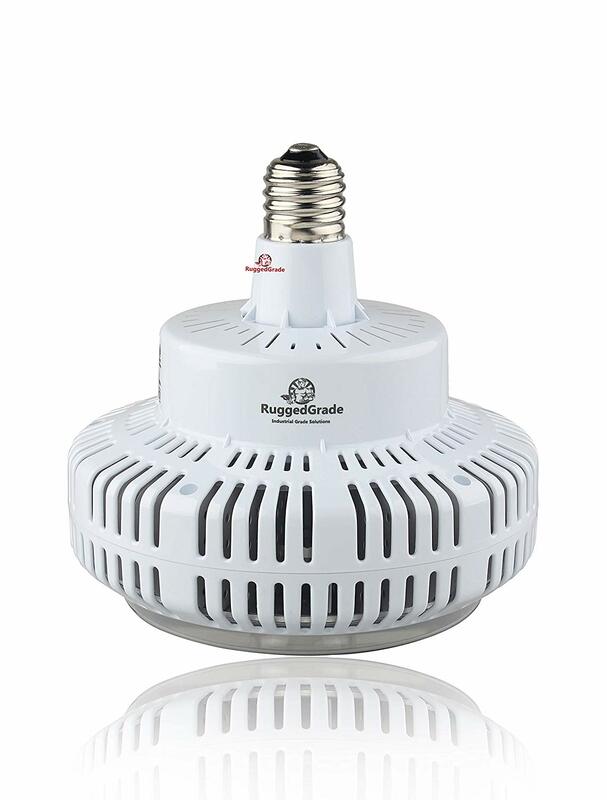 We are starting this list with RuggedGrade and their dimmable high bay LED lighting UFO lamp. An easy candidate for the “Best LED warehouse lighting fixtures” award, this LED UFO high bay light has 100 watts of power, with each watt being verified to deliver over 138 Lumens of light for a total of 14,500 ml of brightness. 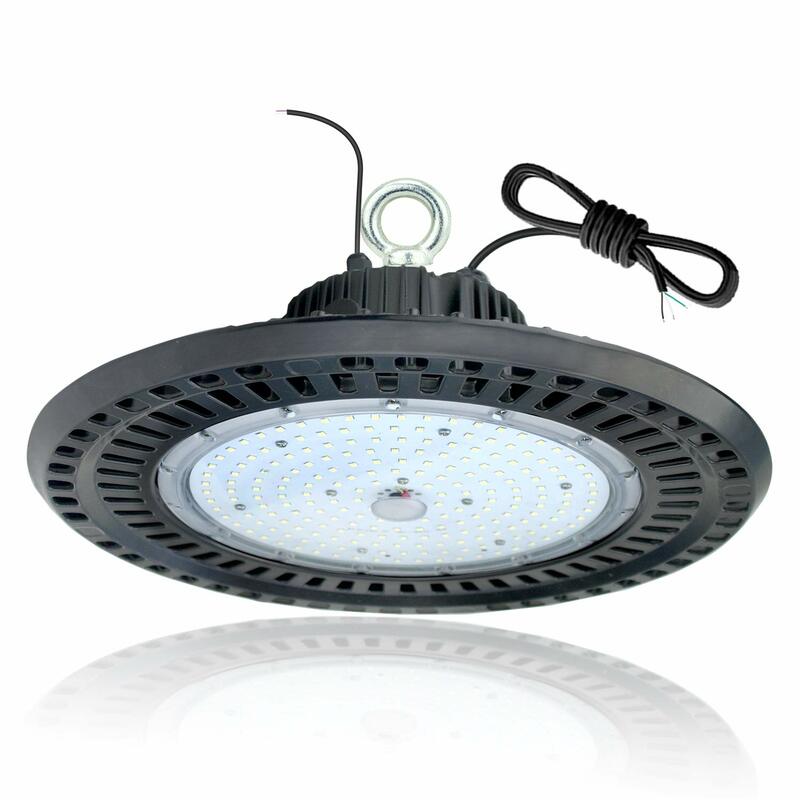 What also places this UFO LED light among the best high bay LED lights is the quality of its design and materials. 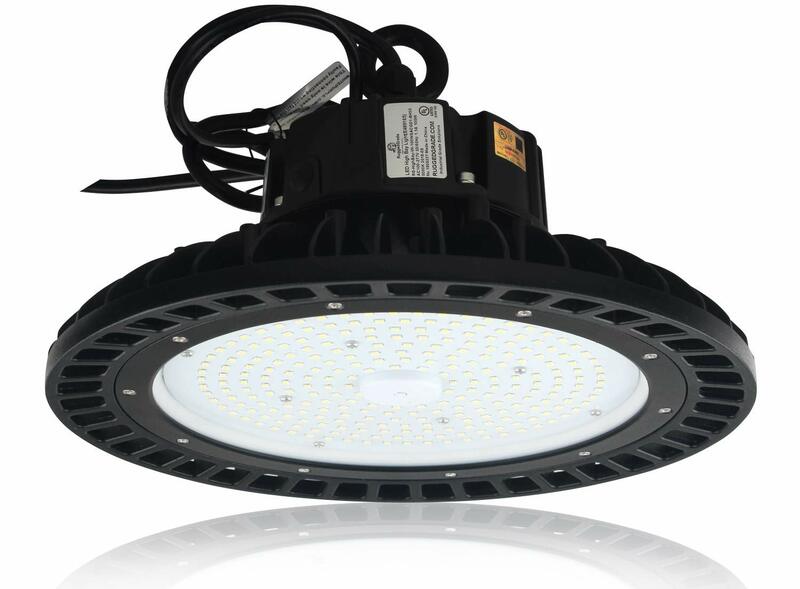 Made with premium grade components, this is an industrial grade UFO LED high bay light. 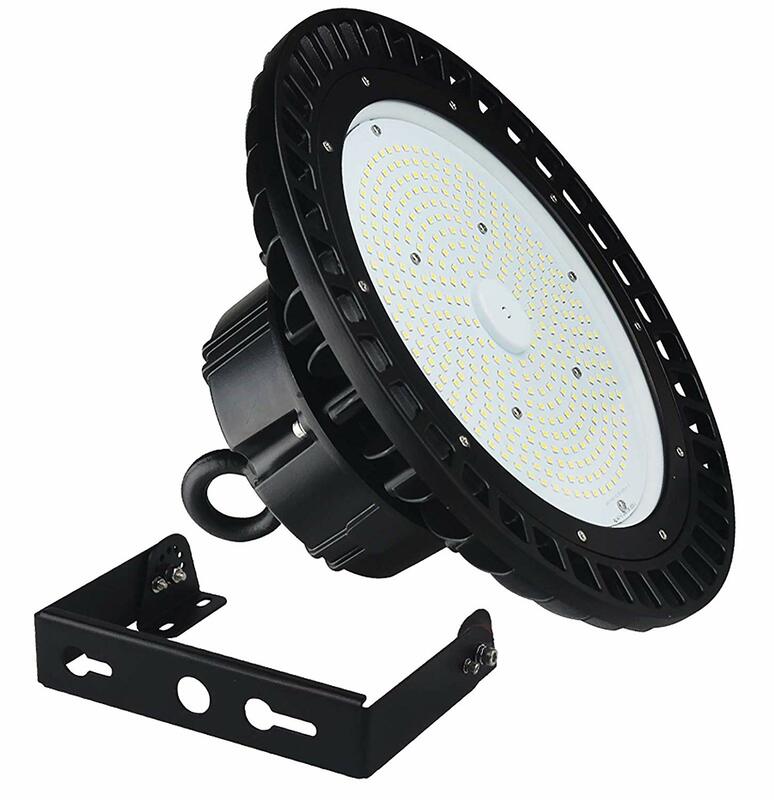 In terms of dimensions, the RuggedGrade dimmable LED UFO high bay light is also among the best-LED warehouse lighting fixtures out there. With a compact size of 10.6 inches / 280 mm in diameter and practical design, this warehouse pendant light is much easier to install without making sacrifices in the quality of its light. The Preinstalled Hook and the light weight of just 9 pounds / 4.1 kg also help with that. Another impressive feature of this RuggedGrade LED high bay warehouse lights lamp is its 3 in 1 dimming function (1˜10Vdc or PWM signal or resistance). It allows the light to be dimmed to the ideal brightness levels needed in its environment at any specific moment or to save energy if necessary. To do this, you will need to use low voltage wires and a 0 – 10 volt dimmer or controller. Additionally, you can also use said low voltage control wires with things such as motion sensors, photocells or other types of smart controls. The RuggedGrade LED high bay lamp also has 120 degrees angle of operation which helps to spread the light and reduce shadowing. UL Listed and DLC verified (RG-HB05-100W), this RuggedGrade LED garage light fixtures lamp is also backed up with a 5-year warranty. 3 in 1 dimming function that can both save power and allow you to customize the lighting. Premium quality components and design make this RuggedGrade warehouse pendant light one of the best commercial LED lighting options on the market. Great dimensions of 10.6 inches / 280 mm in diameter and a weight of 9 pounds / 4.1 kg make this a very practical and easy to install industrial LED lighting fixture. 100 watts of power and 14,500 lumens of brightness ensure a great lighting experience. UL Listed and DLC verified(RG-HB05-100W) with 5 years of warranty. The power cord is rather short so you’ll either need to place the lamp close to a power outlet or get a longer power cord. These GRANDLUMEN commercial lighting fixtures impress with both their 150 watts of power and 19.500 lumens of brightness, as well as their great design. Next on our “Best high bay LED lights” list are these GRANDLUMEN LED commercial light fixtures. The combination of Meanwell HBG series driver and Luxeon LED make this industrial high bay LED lighting very durable and practical without diminishing its lighting capabilities at all. What’s more, GRANDLUMEN also has an ETL certification which guarantees that their LED high bay light fixtures are of the utmost quality and ensure the safety of operation. In terms of their design and components, these GRANDLUMEN LED high bay light fixtures to have very practical and comfortable dimensions of 10 inches x Length 13 inches x Width 12 inches and a weight of 9.3 pounds. This, together with their great design and preinstalled hook make both the installation and replacement of these lights exceptionally easy. Additionally, these GRANDLUMEN LED high bay fixtures also impress with their great heat dissipation. The cold forging aluminum makes for very good heat dissipation and ensures a longer life for the LED light and the driver. With 1500 watts of power and 19.500 lumens of brightness, the GRANDLUMEN UFO LED gym lights are more than powerful enough for any warehouse, commercial or gymnasium lighting. With an ETL certification of quality, the GRANDLUMEN round LED high bay lights guarantee high quality and safe operation. The power cord is impractically short and very hard to replace since the entire power supply is sealed into the housing. These GRANDLUMEN industrial light fixtures do not have a dimming feature. The WYZM impresses with its 110 ml per watt brightness, as well as with its dimming feature and excellent design. Our third LED high bay fixtures option comes from WYZM in the form of their high bay LED lights. They have models ranging from 60 watts of power to 240 watts, each impressing with 110 ml of brightness per watt. This means that their 150 watts model has 16.500 ml of brightness which is truly impressive. With such a conversion rate, LED high bays such as these can effectively cut your electric bills in half compared to using regular 600 watts UFO high bay lights. Another feature of the WYZM LED UFO lights is there dimming option. Capable of dimming between 0 and 100% by a 0 – 10 v wall dimmer, these LED high bay lights can be customized to your lighting needs and to your power saving requirements. Perfect for usage in garages, warehouses, stores, supermarkets, and other such locations, the WYZM LED high bay lights are also ETL listed, meaning that their high-quality performance and safety are virtually guaranteed. They also come with a 120-277V 5-year warranty, plus they also have an IP65 rating which indicates that they can also be used outdoors. With 110 ml of brightness per watt, this WYZM LED high bay lighting fixture can outperform other models that consume 3 – 4 times more watts. The dimming feature allows the customer to customize the brightness of their WYZM UFO LED lighting as they see fit, whether to conserve power or to create their preferred ambiance. The WYZM LED high bay UFO shop light is ETL listed for its outstanding quality and has an IP65 rating which means that it’s usable outdoors. With a 5 years and 60,000 hours warranty, the WYZM LED high bay shop light is guaranteed to be worth its price. The main and only design flaw of the WYZM UFO LED high bay lights is that there is no support for the center of the bulb which leads to sagging and requires fastening. Featuring just 3 different UFO high bay LED lights would have been silly considering the vast range of different high-quality products that the market has to offer, which is why we have also listed the next 7 best products we managed to find. Each of these UFO LED lights impresses with a lot of its qualities but they just couldn’t make it into our Top 3 for one reason or another. Still, given the different needs, preferences, and circumstances that users have, it’s quite likely that you’ll find what you need below even if you didn’t find it in the Top 3 list. This UFO LED high bay light by OOOLED has 150 watts of power and is capable of delivering up to 22,500 lumens of brightness. It also has an IP65 waterproof rating meaning that it is usable outdoors. Some minor hardware design flaws prevented this lamp from entering the Top 3 but it came pretty close. 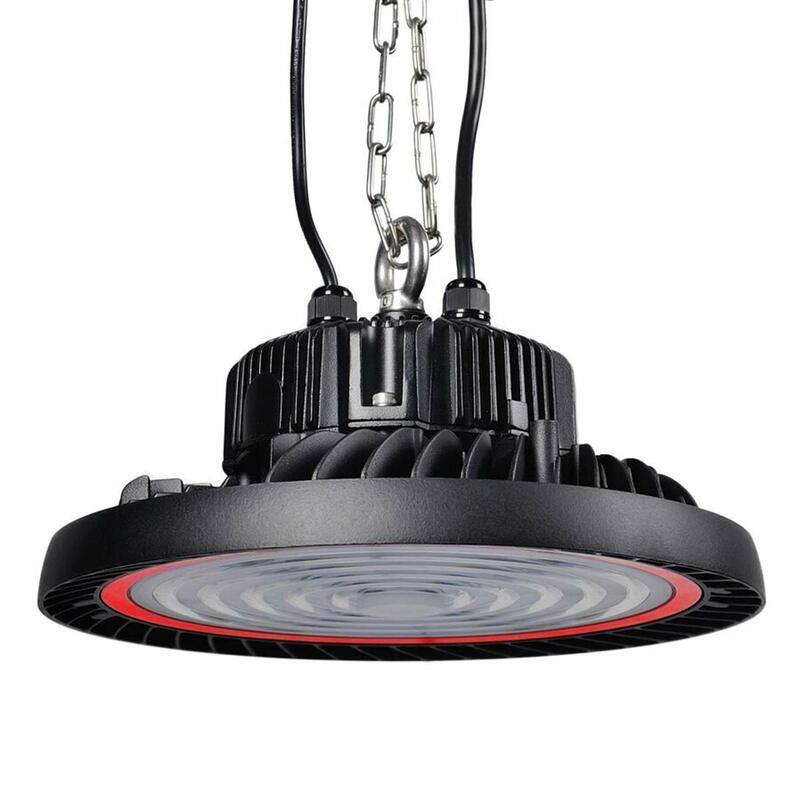 A second option from RuggedGrade, this LED high bay UFO light offers 13,500 lumens of brightness for just 100 watts of power consumption, which is more than impressive. It has a 3.3 feet long power cord which is more than even some of our Top 3 listings but it falls short on some other features such as the lack of a dimming option. Another RuggedGrade entry, this next RuggedGrade LED high bay light offers a more unique design choice. It is capable of delivering up to 127 lumens per watt and consumes only 100 watts of power which makes it a highly efficient alternative to a lot of other UFO lights. Easy to install, effective and durable, the one main drawback of these lights is that they are not dimmable so with a ceiling lower than 15 feet that can be hard on the eyes. Miiruop also made it into our list with their Miiruop UFO LED high bay light fixture. They have DLC, ETL, TUV, UL, CE, and ROHS certifications ensuring their high quality, which is well deserved with their 150 watts of power consumption and 130 lumens of brightness per watt, resulting in 19,500 lumens overall. Easy to install and maintain, this Miiruop UFO LED high bay light fixture almost made it into the Top 3 but we just preferred the other designs over it. Adiding also made it into our list with their Adiding UFO LED high bay warehouse lighting fixture. With just 150 watts of power, this UFO light is capable of delivering up to 19,500 lumens of brightness. It is also dimmable which is a great plus for commercial indoors use, but some minor design preferences made us choose other options for our main list. If you want to light something as brightly as possible, the Viugreum UFO LED high bay light is capable of delivering 25,000 lumens of brightness with its 250 watts of power. It also has a unique design as its porous structure allows the casing to better balance the pressure for an improved lifetime. It also has an IP65 rating which makes it usable outdoors. The lack of a dimming feature and the 1-year warranty, however, are what made us reluctant to place it in the Top 3. Last but not least, the Dephen LED high bay light is another very powerful option for your warehouse, shop, garage or another area. With a brightness of 20,250 lumens delivered with a wattage of 150 watts, this UFO light can light up anything you put below it. It’s also dimmable and controllable which are great features to have but some customer support issues from Dephen have made us put their UFO LED light in the Top 10 and not the Top 3 of high bay LED lighting fixtures. First and foremost, LED lights drastically improve the cost efficiency of lighting. LED lights to use much fewer watts ( electrical power) to produce the same amount of lumens (brightness) as non-LED light sources like HID (High-Intensity Discharge) or fluorescent lighting systems. Depending on the UFO LED lights you can save 3 or 4 times more watts for the same amount of lumens, or sometimes even more. LED lights are much easier to use in conjunction with lighting control systems which often allows the user to dim them. This can further decrease the amount of power your lights consume compared to non-LED lights plus it can allow you to better customize your lighting depending on the situation. UFO high bay LED lights also offer improved aesthetics compared to most other non-LED lighting sources like HID or fluorescent lights. Of course, aesthetics are mostly subjective so everyone is in their right to prefer other types of light, but the general consensus is that the light from UFO high bay LED lights offers a much more pleasant atmosphere and better accents the true colors and intricate shapes of the objects being lit. Affordability is also a big factor when it comes to LED lights, in addition to energy efficiency. Years ago, when LED lights were first introduced to the market their prices were much higher than those of other lighting systems but it has dropped substantially since then. Nowadays, LED lights are on par with other types of lights when it comes to their initial price, yet a lot of people are still under the impression that they are more expensive. Another huge advantage of LED lights, whether for residential or for commercial use, is their life expectancies. The average lifespan of a high-quality UFO high bay LED light is between 30,000 hours and 50,000 hours, or in other words – up to 10 years. This is significantly longer than the lifespan of regular HID or fluorescent lights which means that you’ll not only spend less money for new lights but will waste much less time and energy on constantly replacing your lights systems. The safety of LED lights is also an important thing to note. Fluorescent lights contain mercury which means that they have to be disposed of with great care, while HID lights emit a significant dose of heat which, while not dangerous for our health or the environment, often makes them impractical for commercial spaces and properties as it can put your merchandise at risk. All these benefits sound great, but what is it about LED lights that makes them so awesome? How do LED lights actually work, whether in UFO high bay lighting or in regular residential lights? “LED” stands for “Light Emitting Diodes”, which essentially means that a LED light is made out of numerous tiny bulbs that all fit easily on an electrical circuit. The difference between these small light bulbs (or diodes) and regular HID bulbs is that the LED’s diodes don’t contain a burning filament. That’s why LED lights don’t get hot. Instead, LED’s diodes are illuminated by the movement of electrons in a semiconductor material. This is what allows them to last for as long as any standard transistor and drastically surpass the longevity of HID or fluorescent lights. This simple construction of LED lights is the core reason for all their features and benefits we listed above. As a result, LED lights are used in much more than just commercial or residential lamps. Instead, you can find light emitting diodes in anything from digital clocks and remote controls to television screens and traffic lights. Traditional high bay lights. These are the typical and well-known pendant-style fixtures, usually made of aluminum. These lights used to be made for HID or fluorescent lights as their shape supports the omnidirectional nature of these lights. If you wish to use LED lights in such a traditional high bay fixture, however, you absolutely can. Round high bays or UFO lights. These round high bay lights are what people typically call UFO lights. They are made specifically for LED lights as they don’t include reflectors because LED lights don’t need reflectors – they are intrinsically more directional than HID or fluorescent lights. This clever usage of the LEDs’ features makes for a much more compact and low-profile design. These UFOs are usually IP65-rated, meaning that they are suitable for outdoor use as well. Panel high bays. These wide and long panels are traditionally meant for fluorescent lights but they can also be used with long LED light tubes or magnetic LED strips. Their design allows them to distribute their light over a larger area which can be beneficial in places where one UFO light won’t be quite enough but two UFO lights would be a bit too much. Linear aisle lights. At first glance similar to panel high bays, linear aisle lights are more narrow and have beam angles that make them more suitable for lighting between aisles in warehouses, grocery stores, and other such locations. Buying UFO high bay LED lights is often one of the best things you can do for your commercial or storage properties as such lights can drastically improve the atmosphere, power consumption, and lighting. Still, as with any other product group, you’ll need to make sure that you’re buying a high-quality product that’s also of the exact type, size, and quantity your property needs. Commercial lighting is very important both for storage and for front-end purposes. For this reason, you need to make sure that whatever you buy will be of truly high quality. Unfortunately, LED light manufacturers don’t have the habit of admitting when they are selling a subpar product so you can’t really use their advertising as a guideline. Instead, as with any other product group, you’ll have to inform yourself the traditional way – from consumer reviews and professional industry reviews. The former are often too subjective and incomplete while the latter can be more informative but also sometimes biased. 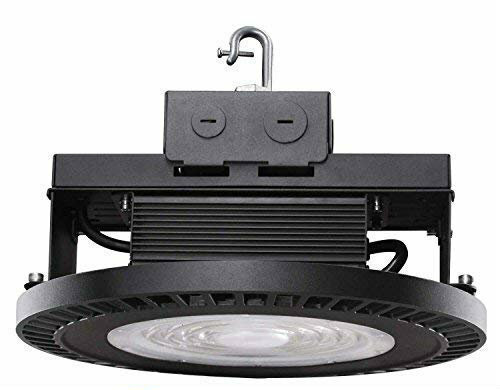 Still, reading and listening to enough reviews from both types will eventually start to give you an idea of which UFO high bay LED lights are worth paying attention to and which should be avoided at all cost. As a side bonus, you’ll start noticing the subtle non-quality-related differences between the various UFO models and figure out which ones are better suited for your particular situation and which ones – not so much. An additional way to judge the quality of different UFO high bay lights is by looking at their manufactures. Considering the brand of the LED lights you’re choosing is almost always beneficial. Obviously, branding isn’t a 100% guarantee of quality, but it is an indicator that’s worth looking at. For starters, here are the brands we’d recommend you look at first: OOOLED, RuggedGrade, WYZM, GRANDLUMEN, Dephen, Adiding, Viugreum, Miiruop, and others. Subjective design choices. There are a lot of factors that make different models of UFO LED high bay lights more suitable for some situations and less suitable for others. Some UFO lights are meant for lower ceilings while others are intended for higher ones. Some UFO lights are dimmable which a lot of customers are looking for while others are not because that feature isn’t always needed. Plus, a lot of UFO models also consist of different design styles if you want your UFO lights to go well with the rest of the interior in your property. Simply put, don’t just look for “good” UFO high bay LED lights, but instead look for ones that will suit your needs. Lumens per Watt. The Lumens per Watt (L/W or LPW) index is another good way to judge LED lights. This value shows how much brightness (lumens) a LED light delivers per a unit of electrical power (watt). For a truly good UFO LED light you can expect to get 100+ lumens per a single watt. For industrial lighting with hundreds of watts per fixture, this usually means tens of thousands of lumens delivered from every UFO LED light. Create a layout. The different spaces in your warehouse, commercial store or parking lot require different lighting because of their various sizes and contents. Where some smaller storage rooms may require lighting of just 250 lux, other bigger warehouses may need 500 lux and front-end commercial places may require up to 800 lux. This is important not only because installing a weaker light on a high ceiling will result in insufficient lighting, but also because installing an overly bright light low to the ground will be impractical for everyone who works or shops in that place. Consider the horizontal spacing between the lights as well. For low ceilings of about 15 feet, make sure that there are about 12 horizontal feet of distance between each UFO LED lighting fixture. For medium height ceilings of about 20 feet left at least 15 horizontal feet between the different fixtures. And for high ceilings of about 30 or more feet make sure that there is at least 20 – 25 horizontal feet between the different UFO LED light fixtures. Calculate the exact number of lights you’re going to need based on the previous consideration and make sure that they are all of the design types you need. In our breakdown section, we listed the several general types of high bay lighting fixtures, so don’t forget to determine how many of each type you are going to need before you start looking for specific brands and models. The great thing about UFO high bay LED lights is that they require minimal maintenance. As long as they are properly installed and the electrical installation is well-made, you can expect to not have to pay any attention to your UFO LED lights for years. The most important part of achieving that is making sure that the electrical system is adjusted for the amount of wattage that your new UFO LED lights are going to consume. Once this is calibrated, and as long as the whole system is properly maintained and protected, you should have zero problems with your UFO lighting. 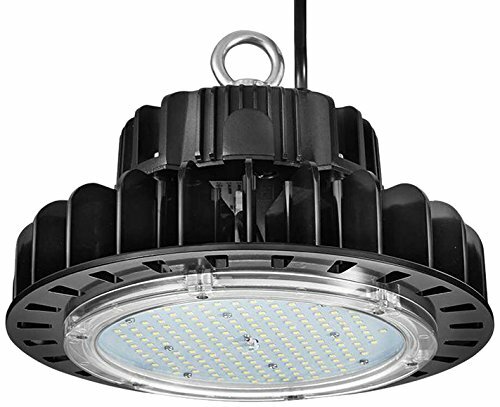 As you can see, while most UFO high bay LED lights don’t differ much in principle, they can actually differ quite a bit in terms of their quality and design. There are UFO high bay lights for outdoor and for indoor use, there are brighter and dimmer ones, there are UFO LED lights higher or for lower ceilings, there are once with adjustable brightness settings, but most importantly – there are good ones and some very, very bad ones. 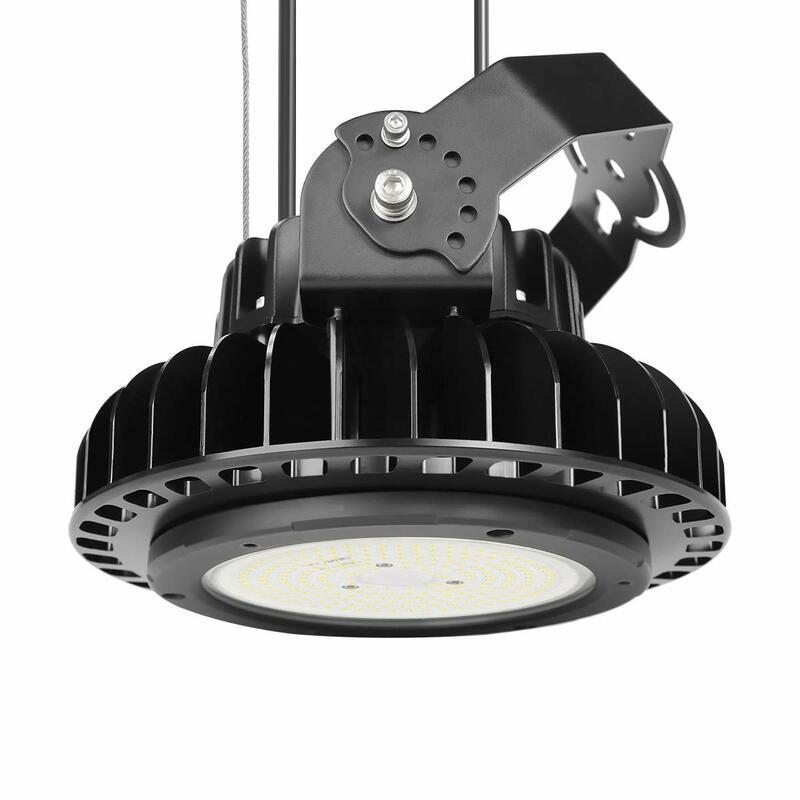 The RuggedGrade dimmable LED high bay light has a lot of impressive features such as 138 lumens of brightness per watt, resulting in about 14,500 overall ml of brightness for very low wattage. It also has a 3 in 1 dimmable feature that allows the user to customize his or her experience with the light. The practical design and 120 degrees angle of operation also make this RuggedGrade dimmable LED UFO light very easy to install and practical to use. The 5-year warranty is also a nice plus. 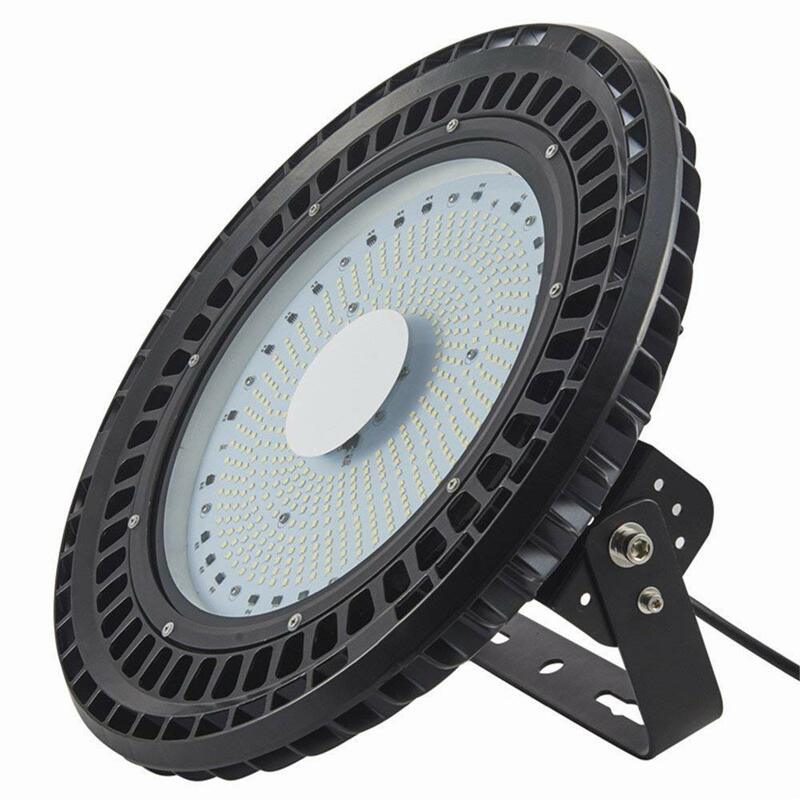 The GRANDLUMEN UFO LED high bay light utilizes its combination of Meanwell HBG series driver and Luxeon LED to deliver effective lighting and a lot of durabilities. The ETL certification also supports this, as does the excellent design of this high bay light. With dimensions of 10 by 13 by 12 inches and a weight of 9.3 pounds, this UFO LED light is easy to install and maintain. The lack of a dimming feature is a drawback but if you don’t need it then you won’t regret choosing this product. Last on our Top 3 list is the WYZM LED high bay shop light. This UFO LED lighting has models that range from 60 watts to 240 watts, each capable of delivering 110 ml of brightness per watt. This makes them a great effect, and efficient replacement for almost any other method of industrial lighting. What’s more, the WYZM UFO LED lights are also equipped with a dimming feature which allows you to customize your experience, whether for power serving purposes or for convenience. The ETL listing ensures quality, the IP65 rating means that these lights are usable outdoors, and the 5 years/ 60,000 hours warranty guarantees satisfaction.